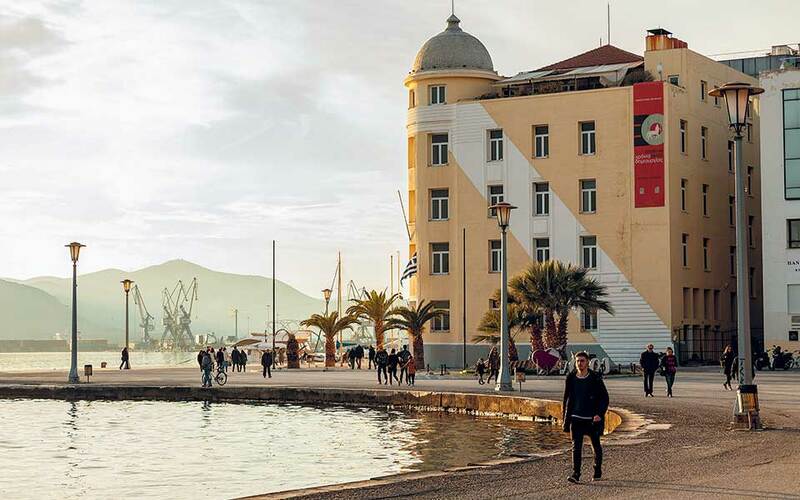 The town of Volos at the base of Mt Pilio has been undergoing a quiet cultural renaissance in recent years with plenty to offer traveling culture hounds. Hatziargyri Street: A narrow pedestrianized road situated between the streets of Iasonos and Dimitriados; a magnet for both lovers of tsipouro (pomace brandy) and the arts. The former make their way to the tsipouradiko of Kavouras, the latter to the Delta Art Gallery (δ.). “Until the 1950s and 60s, streets like this were the setting for all of the commercial business in the entire region of Magnesia. This is where the big apikiaka [“colonial” grocery stores, which sold items imported from European colonies] were located, which offered a range of products, from salted cod to cardamom and cloves. 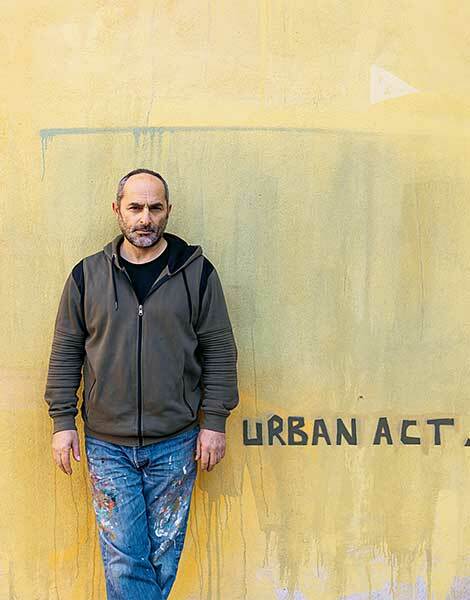 I really liked the idea of creating this gallery on a side street like this,” says Thanasis Doulkeroglou, the proprietor of the city’s sole art gallery, which he opened in 2015. Certainly not an ideal situation. However, fortunately for Voliots, the Delta Art Gallery is so unique that it could potentially transform the city into a destination for art lovers single-handedly. Eyeing the space from top to bottom, you can see how the natural light enters through the skylight, passes through the glass floor of the attic (where Thanasis’ tiny office is located), and finally diffuses throughout the 50-square-meter ground floor. If you take a seat in the office, you might notice how the footstool above the stairs was created so as to save space, and to prevent those making their way up to the attic from hitting their heads. 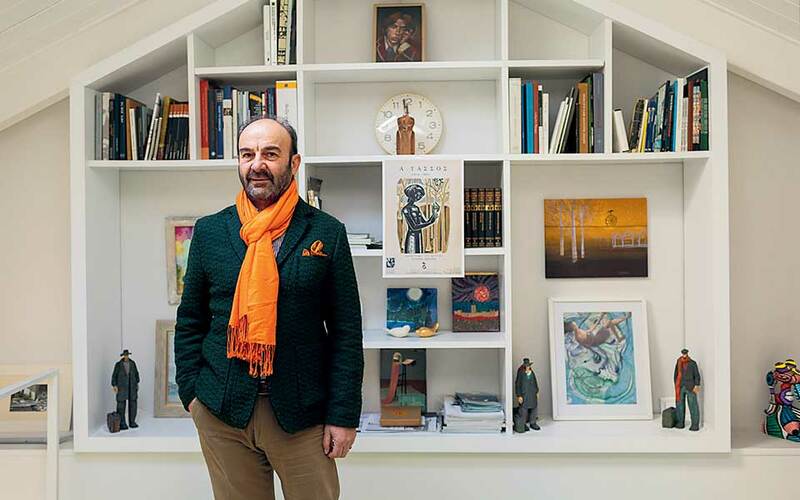 Thanasis Doulkeroglou, owner of the Delta Art Gallery (δ.). The whole project resembles a kind of experiment in logic and functionality, one in which everything exists so as to serve a purpose. The gallery was designed by architect Dimitris Themelis (of the well-known firm Foster + Partners), and the project was presented last September at the 9th Biennale of Young Greek Architects, held at the Benaki Museum. Thus, regardless of whatever works it displays, first and foremost it constitutes a work of art in itself. In just over three years of operation, the gallery has organized and presented exhibitions by numerous artists, including Pavlos Samios, Alexandros Psychoulis, Maria Papadimitriou, George Kordis and Manolis Charos. Of course, it has also featured the creations of Volos native Nikos Podias, whom we get the opportunity to meet under the skylight in Thanasis’ office. “My work is related to memory, whether that is expressed through the materials or the story.” I wonder how many layers of memory are contained in the work he has brought along to show us: An oriental-style shirt made out of used teabags and gold-colored foil from Karelia cigarette packs. “To the Ottomans, these little talismanic shirts were thought to offer the utmost protection. They would wear them under their armor before going into battle, believing that, by doing so, they became immortal.” The flavor-filled memories of tea and cigarettes are mixed with social metaphysical beliefs, and together they are transformed into a work that has the potential to create new sensory memories. 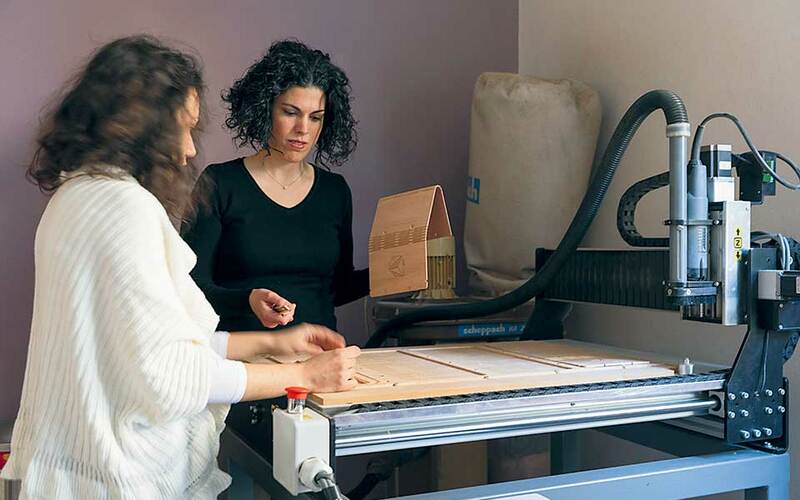 Stella Katsarou and Stella Vilaeti, colleagues at To Architektoniko Ergastiri (the architectural workshop). Shortly before leaving the gallery, I ask Nikos Podias a question I had had on my mind even before the trip began. Searching on the internet for material related to Volos’ artistic events, I chanced upon an interactive app with the imaginative title “Rebranding the City: What I Hate About Volos” (designed within the framework of the 1st Panhellenic Μarketing & Place Branding Convention – Idea Topos 2012, held seven years ago). The app encourages users to cause virtual earthquakes, destroying all of the points in the city they consider unsightly, hostile or unfriendly towards them. Indeed, at first sight, Volos does fail to impress, or enthuse. Following the same course as most modern Greek cities, it was rebuilt following the war according to purely utilitarian – and not aesthetic – criteria. The ornate Volos Railway Station, a work by Evaristo de Chirico. Aghii Theodori Church, in Palia. Namesakes, friends and colleagues Stella Katsarou and Stella Vilaeti, who have set up “To Architektoniko Ergastiri” (the “Architectural Workshop” – which takes on, among other things, architectural design projects and the creation of objects using a 3D printer) are more than qualified to tell us more about the architecture of Volos. 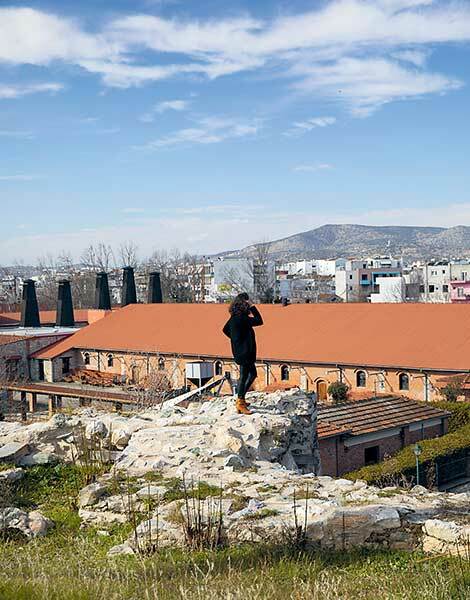 We go on a long stroll together in Palia, the area of the former Kastro (castle), where samples of all of the architectural currents that ever swept through Volos survive. Ottoman elements become entwined with contemporary features, and the modern coexists with the local. A beautiful, trendy building made out of straw and clay lies just a few hundred meters away from the crumbling old gunpowder depot, and from a dwelling made using remnants from the old city walls in its exterior. It is worth visiting Palia, moving along Papakyriazi Street and observing the houses there, trying to guess which ones are on properties that were plotted out during the period of Turkish rule. It isn’t so difficult to do. They are built somewhat askew, and next to their doors are some needless little lanes leading to nowhere. They are irregularly-shaped buildings that look out of place; the city is trying to get rid of them, simply because they are the remains of an age it would rather forget. Fresh fish on the waterfront, opposite City Hall. Having completed our stroll through calm but slightly melancholic Palia, we descend towards the waterfront. 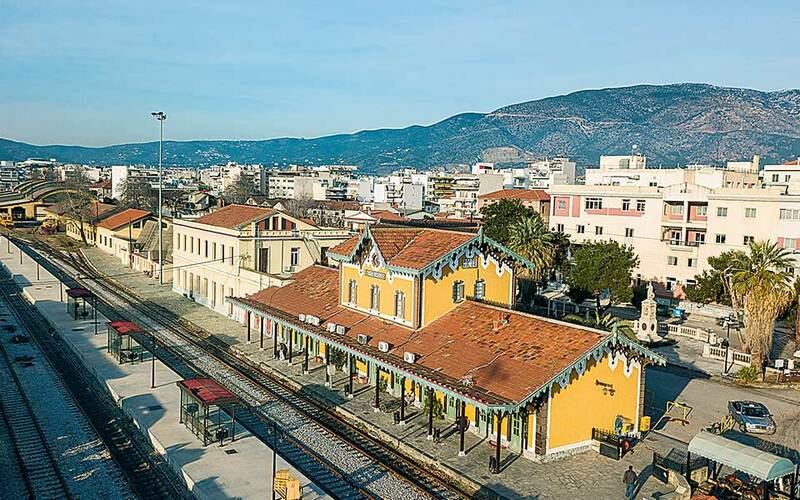 En route, we make a first stop to admire the most beautiful railway station in Greece (a work by Evaristo de Chirico – Giorgio de Chirico’s father), followed by a second stop, so as to gaze at Greece’s most sublime city hall (created by renowned architect Dimitris Pikionis). Something that I found out by chance while hanging around with local artists, is that there is a series of woodcut templates, created by the renowned Greek engraver Tassos, inside the city hall. These are very beautiful; anyone interested in engraving should pass by to get a close-up look. After exiting the city hall, we cross to the other side of the street, to the section of the waterfront where the fishing boats are moored. And what could only be described as an impromptu outdoor performance unfolds before our eyes, starring Voliot passers-by, who walk up and down, observing the fishermen: whenever any of the latter reveals some big fish, everyone suddenly and simultaneously stands motionless and speechless, and stares at it as though hypnotized. It’s truly impressive to see a crowd of people stopping suddenly, transfixed, their gaze fixed on a crate of fish, like they had just discovered a hidden treasure. We move along Argonafton Street, amidst balloon sellers and cyclists, and come up to the Achilleion, a historic cinema dating to 1925. Here, they hold Cine Doc screenings once a month. 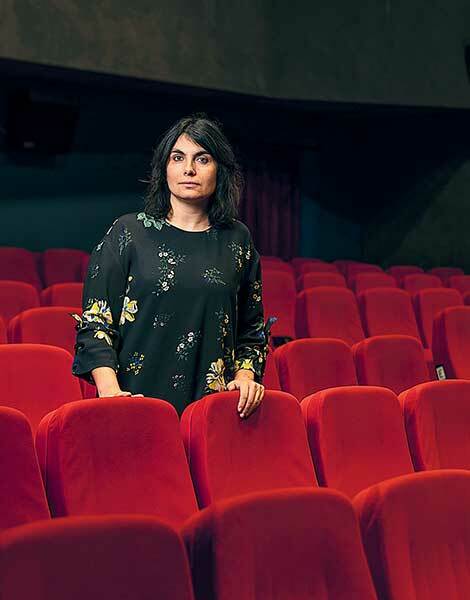 I had thought that Cine Doc was a purely Athenian affair; however, it also takes place in Thessaloniki, Patras, Amaliada and Volos, of course, headed by the energetic Eleni Chrysopoulou, who is an archaeologist and documentary theorist. 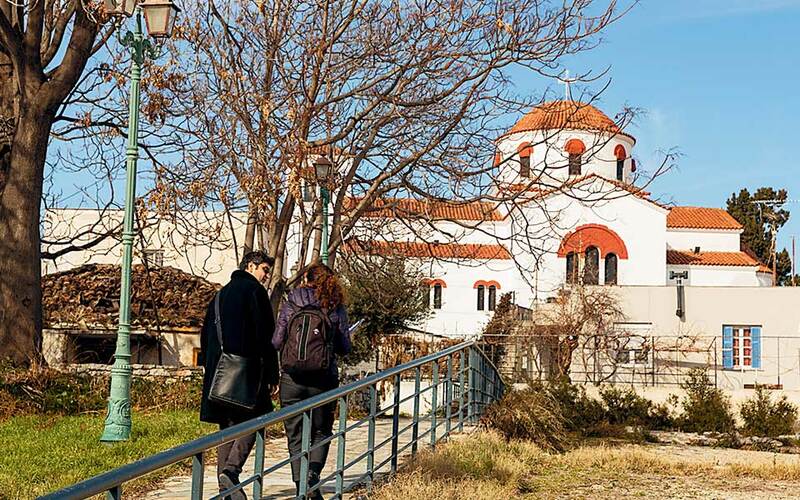 Walking and taking in Volos' architectural landmarks. In the background is the Rooftile and Brickworks Museum N. & S. Tsalapatas. Eleni Chrysopoulou, a documentary theorist and the organizer of Cine Doc Volos. Cine Doc’s mission brings to mind that of the Delta Art Gallery: to create an educated and informed film-going public, despite the fact that the town has very few cinemas. “Our aim is to build up our audience gradually, and that is why our selections sometimes differ from those in Athens and Thessaloniki, where viewers are much more familiar with documentaries. We are very happy, because the public loves us and supports us.” The hall at the Achilleion is able to accommodate up to 220 people, and screenings (one Saturday per month) are consistently sold out. The themes of the documentaries revolve around environmental or social issues (such as “Let the Child be the Guide” about the Montessori system, “The Distant Barking of Dogs” concerning the Russo-Ukrainian war zone, and “When Tomatoes Met Wagner” about the cultivation of old tomato seeds in the Thessalian plain). If you are a cinephile and find yourself in Volos, be sure to catch any screening – it’s well worth it. Enthusiastic dancers from the Lindy Hop Volos team. A turn towards downtown follows the visit to the Achilleion. Somewhere in that vicinity, nestled deeply inside the narrow lanes, is a studio belonging to local Lindy Hoppers. And what exactly is the Lindy Hop? Well, it’s a dance that was created by African-Americans in the Harlem area of New York during the Interwar Period, and which, over time, spread throughout the Western world, from California to Stockholm and in the past five years from Athens to Volos. Teacher and chief motivator Lizeta Manini heads the studio. She has about 35 students, from 15 to 60 years of age. 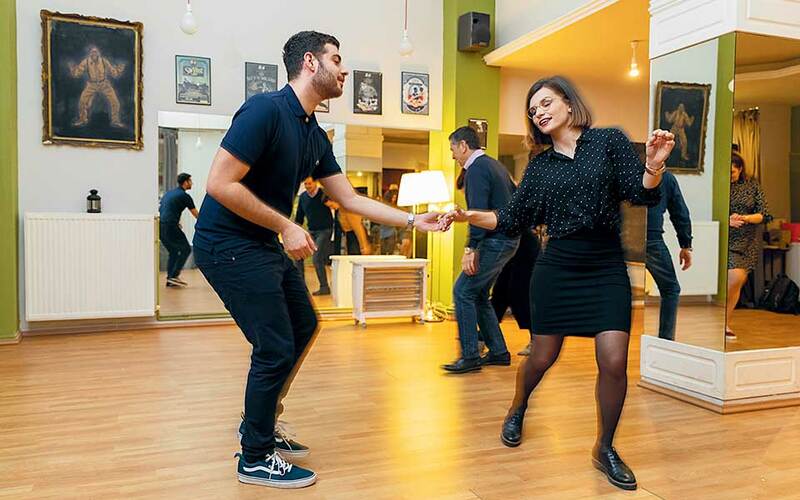 “The Lindy Hop is a social dance that anyone can do, and that is one thing we want to inform Volos about.” Indeed, the dance is extremely uplifting. Besides Lindy Hop and swing, you’ll also be able to find several venues in Volos that host live events. The best-known music spot is Lab Art, located in the Tsalapatas complex, which could be thought of as something akin to the Technopolis cultural hub in the Gazi district of Athens. Here, we meet Nikos Barpakis, who, besides being a member of Lab Art also belongs to the group of people who organize the Volos Music Festival, which takes place every summer. 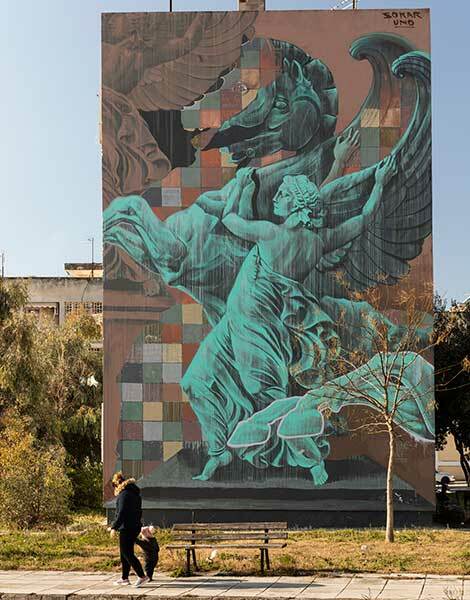 The Lyrist, one of the large-scale murals created by Urbanact, at the 14th Elementary School of Volos. Getting away from the confines of indoor bars and releasing bands out onto the streets can be regarded as a major achievement. This is the only way for art to become accessible and for a city to be made more lively. 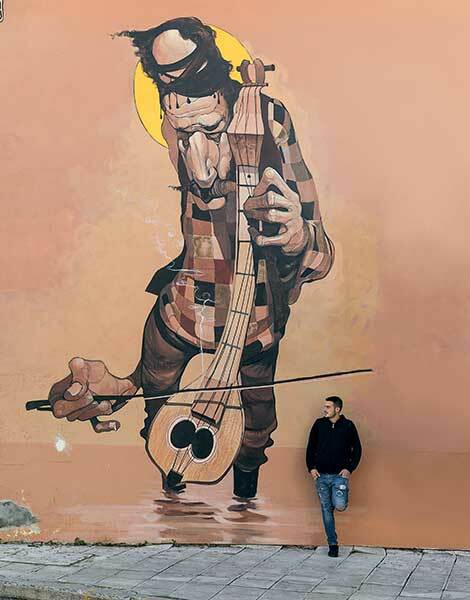 And this is more or less what the Urbanact team has done – in its own sphere – by creating an sort of open-air museum with large-scale murals in neighborhoods throughout the whole of Volos. And that’s just as well, because through the murals, the urban landscape of Volos has changed for the better. From Metamorphoseos to Thiseos Street, and from the University of Thessaly’s Matsagou Building as far as outlying Nea Ionia, large, 2D figures are now scattered throughout the city: There’s the lyre player with a mustache and a turban, a young man with orange roses coming out of his back like the wings of an angel, and the aged centaur Chiron, among other works. The annual Volos Festival is one of the artistic happenings that are upgrading the city’s cultural profile. This year, the event will be held over two periods – June 7 through 30, and then from August 30 through September 9 – and the idea of ‘religiosity’ will be its main theme. The festival will feature productions by the Alternative Stage of the Greek National Opera, the National Theater of Northern Greece and the Wooster Group; screenings; art installations; music events; an acting workshop on Mount Pilio and more. 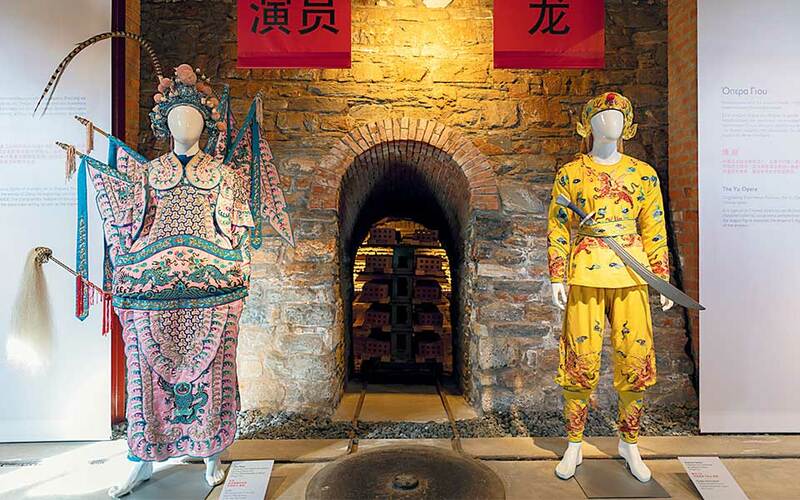 Until March 31, the N. & S. Tsalapatas Rooftile and Brickworks Museum – which is a member of the Piraeus Bank Group Cultural (PIOP) network – is presenting a temporary exhibition featuring 14 Chinese opera costumes (including a Yu Opera dragon costume, a Beijing Opera mandarin costume, and a Yu Opera phoenix costume), as well as a costume worn by the Miao ethnic group. The above are all exhibition items donated by the Chinese Embassy to the PIOP, and provide a great opportunity to get a glimpse of the immense operatic tradition of the Far East. 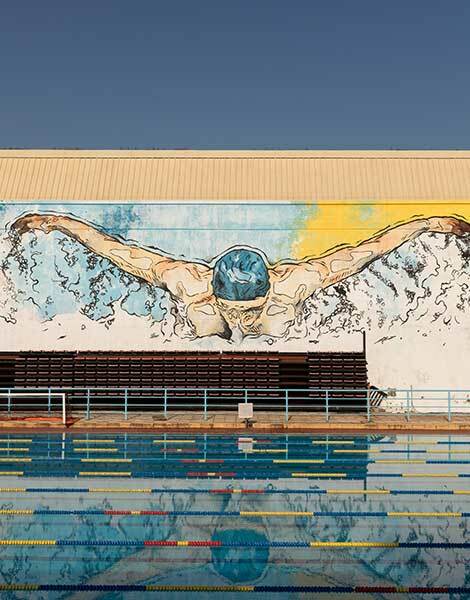 If you’re in the mood to tour the city’s “outdoor mural museum” on your own, then head over to the municipality’s tourist information center or to local businesses like Meraki, and pick up the map showing their locations, produced by the team at Urbanact. You can obtain more information on Cine Doc and Lindy Hop Volos by checking out their facebook pages. Volos lies some 318 km from Athens by car (3-3.5 hours). The cost of road tolls and fuel is about 45 – 50 euros, each way. Valis Hotel (Agria, tel +30 24280.972.60). Situated just a few kilometers outside town. It is luxurious and spacious. Doubles from 100 euros per night. Aegli Hotel (24 Argonafton, tel +30 24210.244.71). An historic hotel, in a convenient and prime section of the waterfront, with renovated rooms and beautiful, minimal decor. Doubles from 90 euros per night. Domotel Xenia Volos (1 Plastira, tel +30 24210.927.00). A hotel whose architecture is unique, it offers restaurants, bars and a spa (with a hydrotonic pool, sauna, hamam and much more). Doubles from 100 euros per night. Hacienda (4 I. Kartali, tel +30 24210.358.29). A cozy place serving good coffee, located next to the park at Aghios Konstantinos. Flokos (42 Kyprou, tel +30 24211.081.68). A little, likeable tsipouradiko (an eatery generally serving tsipouro alongside meze and other dishes) that stands apart from the rest, on account of the distance separating it from the downtown areas where many other like establishments are massed together. La Petite Cantine Project (12 Pyrassou, tel +30 24210.371.09). Beautiful hangout with good food and a comprehensive menu. It serves a warm salad with lentils and sausage, meat dishes and finger food. From the beers on offer, try the local Plastiga. People with disabilities and others from vulnerable social groups make up the staff. Meraki Café (35. P. Mela, tel +30 24210.355.35). Volos’ vegan hangout, with many healthy snack choices. Well worth sampling an invigorating guava shot. Brighton Gastronomiko Mezedopoleio (34 Krokiou, tel +30 24210.750.12). One of Volos’ best restaurants. Contemporary, minimal and very hip, it serves exceptional Greek cuisine dishes – with a twist. Avra (24 Plastira, tel +30 24210.233.83). This country-style eatery, established in 1883, has fed and filled generation upon generation of Voliots. A traditional, “folkloric” taverna, it is located in a really nice spot in Anavros, right next to the sea. Kavouras (3 Hadjiargyri, tel +30 24210.285.20). 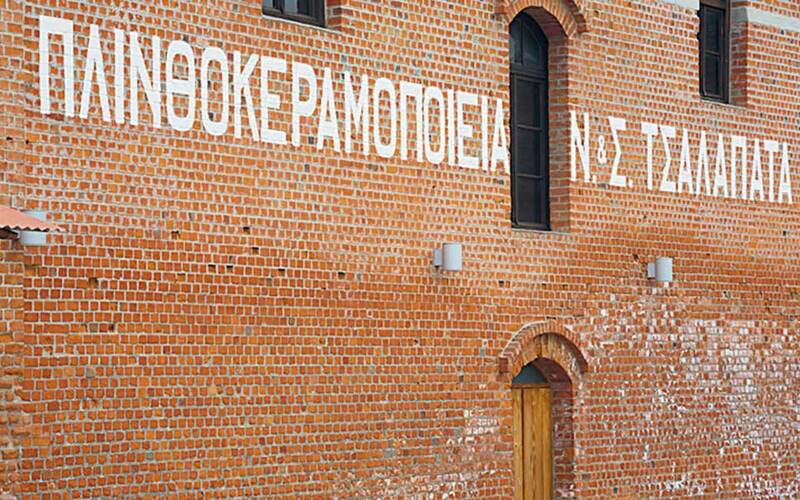 An old-school, traditional tsipouradiko tucked away in the city center. In the business for some 75 years now, it serves up meze dishes created using its own original recipes.